my wordsâ€¦Todayâ€™s gospel manifests the power of Jesus as the author of life. Elijah in the First Reading of today invoked God (in deepest prayer) and asked Him, â€œto let the life breathe return to the body of this child.â€ And the Lord heard the prayer of Elijah; the life breath returned to the childâ€™s body and he lived (1 Kings 17:21-22). Jesus in the gospel, being the Son of God and by the power of His Word, directly called out the dead man, â€œYoung man, I tell you, arise!â€ And the dead man lived again, and Jesus gave him to his mother (Lk 7:14-15). Truly, Jesus is the Way, the Truth, and the LIFE (Jn 14:6). He manifested it in todayâ€™s gospel story. In this event, Jesus would have wanted to provide a permanent solution to death which will not only restore us to our previous earthly existence, but to a true life in Him. So here Jesus wants us to look at the permanent solution on death; and this solution is His own RESURRECTION. He called to life this young man in order to show His tremendous power, that He has control over life and death, and we have to stop crying because we are not helpless against death. God takes care of us (Fr. 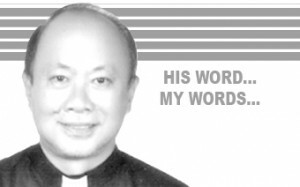 Tim S. Melliza, SSP, Sunday Reflections, June 9, 2013, p. 1). In this Extraordinary Jubilee Year of Mercy, Pope Francis sets before our eyes Jesusâ€™ compassion for the people, which leads Him to heal the sick and feed the enormous crowd. The Pope writes: â€œWhat moved Jesus in all these situations was nothing other than MERCY, with which He read the hearts of those He encountered and responded to their deepest need. When He came upon the widow of Naim taking her son out for burial, He felt great compassion for the immense suffering of this grieving mother, and He gave back her son by raising him from the deadâ€ (MisericordiaeVultus, no. 8 as quoted by Fr. Gil A. Alinsangan, SSP,SambuhayMissalette, June 5, 2016, p. 1). Brothers and Sisters, in this Jubilee Year of Mercy let us heed the call of Pope Francis that in our present generation, the theme of MERCY needs to be proposed again and again with new enthusiasm and renewed pastoral action (MisericordiaeVultus no. 12). And let us bring also into our awareness that our LIFE truly belongs to God and is of God. Everyday in our life, God has visited us: in our joys, sorrows, successes, failures, problems, depressions, stresses, travels, journeys, pilgrimages, and in everything that we do, we have, and we are… Let us therefore entrust everything in life to the Lord Jesus for He will surely lead us to true life. He has died… and He has risen… that we may have life in Him.